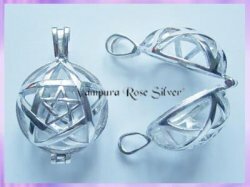 The Locket has been designed as a Pentacle within a Pentacle on both sides. Ideal for tumblestones, crystals or anything else you can think of! The sterling silver chain is threaded through the fixed bale ensuring the case can not fall open. NB: These lockets do not open 'flat' and should not be forced. We are unable to provide replacements for any lockets that have been forced.